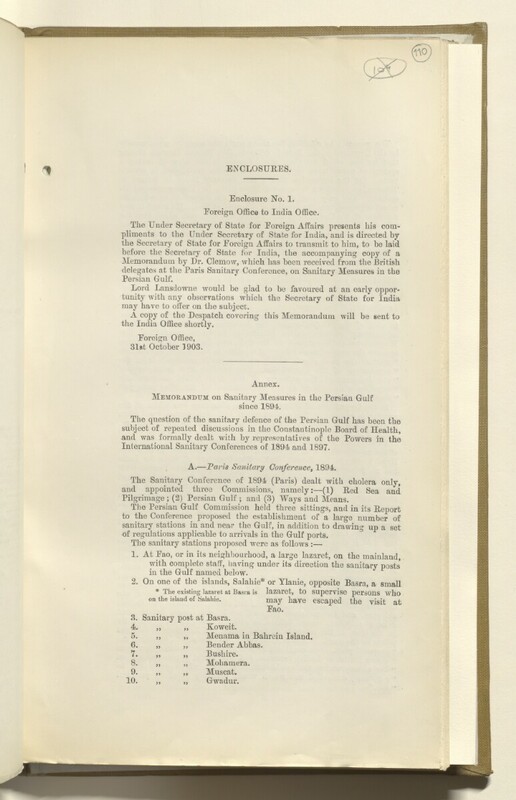 Eoreign Office to India Office The department of the British Government to which the Government of India reported between 1858 and 1947. The successor to the Court of Directors. .
may have to offer on the subject. the India Office The department of the British Government to which the Government of India reported between 1858 and 1947. The successor to the Court of Directors. shortly. Memorandum on Sanitary Measures in the Persian Gulf Historically used by the British to refer to the sea area between the Arabian Peninsula and Iran. Often referred to as The Gulf or the Arabian Gulf. International Sanitary Conferences of 1894 and 1897. A .—Paris Sanitary Conference, 1894. Pilgrimage; ( 2 ) Persian Gulf Historically used by the British to refer to the sea area between the Arabian Peninsula and Iran. Often referred to as The Gulf or the Arabian Gulf. ; and (3) Ways and Means. of regulations applicable to arrivals in the Gulf ports. in the Gulf named below. 3. Sanitary post at Basra.